The Northland by-election is a significant win for Winston Peters. If he can hold the seat at the next election, it could become the foundation of a more secure future for his New Zealand First Party. In the short-term it takes away from National the luxury of being able to pass legislation without having to kowtow to Peter Dunne and the Maori Party, who will no doubt be considering how to leverage their new-found importance. Initially, it was unthinkable that National could lose the Northland seat. It was as true-blue as electorates get. But lose it they did and reasons are not hard to find. Essentially, voters believed they had been taken for granted. While the government’s focus, for reasons that are quite understandable, has been on Christchurch and Auckland, people living in Northland and many other provincial areas have been feeling neglected and ignored. The long term impact of poor roading and limited economic growth opportunities not only generates discontent, but it also creates deep pockets of deprivation and hopelessness. That’s why there have been calls over the years for the government to consider re-establishing special economic zones in depressed areas like Northland, where inducements, such as export incentives and tax holidays, could be offered to attract business investment, jobs and growth. Such a scheme was certainly a factor in the success of a northland-based saw-blade company once owned by Richard Izard. Established in 1980 in the township of Wellsford, with the help of the state incentives that were available at the time, the company grew to become the largest producer of tungsten carbide-tipped saw-blades for the home-handyman market in the world. When it was sold to Irwin International in 1991, the company employed 200 locals and had a turnover of $50 million. At its peak over 500 people worked at the factory, and tens of millions of dollars a year were pumped into the local economy. Last year the chief economist of the New Zealand Institute of Economic Research, Shamubeel Eaqub, coined the term “zombie towns” to describe provincial townships with aging infrastructure and aging populations. The by-election result should surely compel National to consider more carefully the plight of such struggling communities in regions like Northland, to determine what more can be done to help revitalise them. As a result, consents will often take years to go through the process – council hearings, the Environment Court, the High Court, the Court of Appeal, the Supreme Court, all costing applicants such vast sums of money, that in the end many are forced to abandon their project altogether. This is what happened to the coal mining company Bathurst Resources, when they applied for resource consents to open up coal fields on the West Coast’s Denniston Plateau – an area that has been mined for over 100 years. The community welcomed their proposal and it was approved by the Buller District Council in 2011. However, within a month environmental groups appealed the decision to the Environment Court claiming the mine would harm biodiversity, damage ecologically sensitive land, and exacerbate climate change. Every finding in favour of Bathurst resulted in further appeals to the High Court, the Court of Appeal, and the Supreme Court. It took two years of court battles before the company finally gained their required consents, but by then the price of coal had collapsed to the point where the project was no longer viable. Bathurst had spent more than $15 million dollars obtaining consents for the new mine – not to mention the huge cost of delay. They had planned to invest $250 million into the region, creating 225 jobs, but it was all destroyed by environmentalists using the RMA. As a result of the Northland by-election, National no longer has the numbers in Parliament to ensure the RMA gives the same weight to economic development as it does to protecting the environment. Neither United Future nor the Maori Party will support this change. Exactly where Mr Peters stands on this matter is yet to be established. However, New Zealand First’s primary industries spokesman Richard Prosser has indicated that he may support RMA reform. In December, he criticised a $16,875 fine by the Environment Court against farmer Bas Nelis for the unlawful use of land and disturbing a riverbed, after dirt fell into a stream, while he was clearing a gully with a digger ready for replanting with natives. Given that Mr Prosser clearly blames the government for the draconian state of the RMA, New Zealand First may be more willing to support reform than National thinks – but then maybe not … and that’s the problem with dealing with Winston Peters. However, as the new Member for Northland, Mr Peters will have recognised that the region has been suffering for years from a lack of industry and development – some of which has been caused by the RMA. 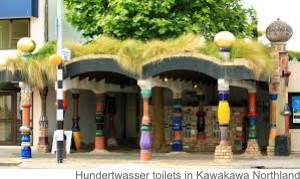 Take the case of Kawakawa, a small northland community riddled by unemployment but well known for its Hundertwasser toilets and a train that runs down middle of the main street. The township is located on what used to be some of the world’s finest quality coalfields. Under the poor farmland, huge mineral wealth might still exist, but if anyone was to suggest that it should be extracted to provide wealth, jobs and hope for the region, the environmentalists, armed with their most effective weapon, the RMA, would block development. And if the Bathurst example wasn’t enough to dissuade anyone from even considering a mining project, remember the fiasco over Powelliphanta Augustus? When Solid Energy wanted to expand their Stockton mining operation near Westport in 2005, environmental groups opposed their plan claiming a population of some 500 rare snails would face extinction if it went ahead. Solid Energy eventually won the right to mine – on the condition that the snails were moved to a new habitat. It turned out that the snails were not as threatened as the environmentalists had made out, with almost 6,000 collected. While over 4,000 were released into new habitats, the Department of Conservation, which was overseeing the whole operation, managed to freeze to death around 800, which they had kept in semi hibernation in a cool room. Altogether almost two years of delays cost the company $25 million in lost earnings and $10 million in collecting, housing and creating new sanctuaries for the so-called endangered snails – as well as fighting the never-ending stream of legal challenges by environmentalists. So, as well as balancing economic development with protecting the environment, what else was National proposing to do with the RMA? In a speech in January, Nick Smith, the responsible Minister, explained that their previous reforms had shortened council processing times, prevented the law from being used for anti-competitive purposes, removed the requirement for property owners to obtain consents to prune backyard trees, and established the Environmental Protection Authority to deal with nationally significant consents. If that agency had been around in the nineties during the construction of the Orewa to Puhoi motorway extension, it would have undoubtedly prevented years of delay due to the concerns raised by environmentalists over mudfish habitats and other such matters. Indeed, the whole northern motorway project would probably have been completed years ago, providing much needed benefits to the Northland region. Dr Smith quoted Treasury research which not only showed that New Zealand ranked at the bottom of the OECD when it comes to the administrative burden of the RMA, but it blamed the Act for adding around $15,000 to the cost of a section and $30,000 to the cost of an apartment. Over the past decade, the delays, uncertainty and costs associated with the RMA have been estimated to have “reduced housing supply by 40,000 homes and added $30 billion in cost”. He then outlined a further ten changes that National is proposing to include in the Act: significant natural hazards; urban planning; affordable housing; infrastructure; property rights; national planning templates; faster plan development; encouraging collaboration rather than litigation; national regulations; greater use of the internet. However, the real question is whether further tinkering will be enough to overcome the massive problems caused by the RMA. With that in mind, a growing number of people are now thinking that the best way forward could be to replace the Act altogether. “Having worked extensively under both the Town and Country Planning Act and the Resource Management Act, I believe that it is time to start over, to separate environmental guardianship from responsibilities for development”. More details can be found in a summary version of Resource Management for the 21st Century and the full paper on our NZCPR.com website. The irony is that as a result of the Northland by-election, the fate of the RMA is now in the hands of Mr Peters. Does he truly care about the long-term well-being of Northlanders, or is he too going to deliver more show than substance for his constituents – some new bridges and a bit of tar seal, when what they really need are jobs. Do you agree with National that economic development and protecting the environment should be given equal weight in the RMA?